2014 was a revolutionary year, as we coded Trend Blaster in Amibroker platform. It is an amibroker afl for intraday trading. 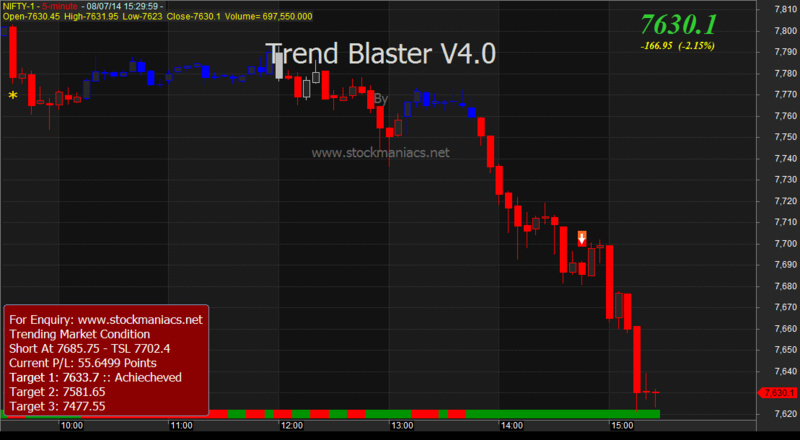 But there are many trading systems, so what is so special in trend blaster?? What is Trend Blaster afl?? It is a trading system that have multi time frame analysis in-built and is trend following. This can be the exact question coming into many readers mind. YES, Trend Blaster is a highly accurate afl if used with proper settings. Trend Blaster has a Zoom Scan feature, that will show you scrips passed or failed. We know trend following trading systems fail miserably in range-bound market. So if you have an way to know exactly which scrip is trending and apply the trading system on the particular scrip(s) it will be like a JACKPOT. YES, Trend Blaster zoom scan will show you which scrip is PASSED and which scrip is FAILED. Apply the system on the PASSED scrips and you will get above 80% accuracy if not more. And check the video below to know how scrips can be traded after they are zoom scan PASSED.